“Yikes, so many greens to mix”. Beginning painters always struggle with mixing the “perfect green”. There are lots of greens out in nature. Paint manufacturers want to sell you as many tubes of paint as you are willing to buy. So they mix up all these different greens. Some you’ll see are Brilliant Green, Chromium Green Oxide, Cobalt Green, Green Earth, Permanent Green, Olive Green, Sap Green and my least favorite, Phthalo Green. Basically most greens are a just mixture of the two primaries, Yellow and Blue. I’ll be presenting an easy step by step process to mix all the colors from freshly cut grass to olive green oak trees. Keep it simple & limit your primary colors. You don’t need to buy 5 tubes of green, just to get the right color. The key to mixing greens is to practice mixing them with only a limited number of Yellows and Blues. I recommend using Ultramarine Blue to start, as it is the most versatile blue you can use for painting. Practice mixing a “Green Value Scale”. Imagine a Black & White value scale where you go from 100% Black, thru the values of 80%, 60%, 40%, 20% grey and finally 100% white. You have all seen this classical Black to White Value scale. Now replace the Black in the example with Ultramarine Blue and replace the White with a Cadmium Yellow Light or Med. Mix a “Greens value scale” like the photo above. Make sure you have a full “value step” or change in color from swatch to swatch. I recommend you save this exercise on a small 5×7 or 6×8 canvas board and write down the pigment colors used and the brand of paint for future reference. Next, vary ONLY your yellow pigment for more shades of green. Try using a cooler yellow like Lemon Yellow to get that fresh cut grass color. Or substitute Yellow Ochre, a desaturated yellow, for that earthy oak green foliage. All the time you are using the same Ultramarine Blue. Limit your color mixing to the “local color”, plus a lighter & darker version. I always try to mix the “medium value local color” of the object being painted. 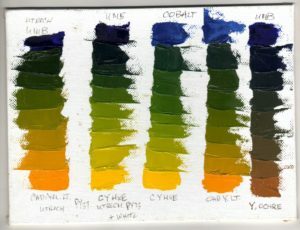 Mix a medium value green of the tree or bush you are painting using your favorite yellow and Ultramarine Blue (UMB). Next darken that same medium green mixture with more blue to make the “shadow green” value. Going back to the medium value green mixture, add more yellow to make the “highlight green” value. You should now have 3 different values of green, the lightest highlight, the medium value green and the darker shadow green. It’s all about brush mileage, so practice, practice and practice. Challenge yourself to mix as many greens you can mix using Ultramarine Blue only and varying the different yellow I have mentioned. Then replace the UMB with a Cobalt or Kings Blue by Rembrandt and again vary your favorite yellow. FYI, I do NOT recommend using Cerulean, Manganese or Phthalo Blue ever. They are man-made synthetic blues, not normally found in nature. Also any paint name that says HUE or Etude, means they have cut the pigment strength of the paint with fillers, often marble dust, to lower the price and quality of the paint pigment. You get what you pay for. Expensive perfume or eau de toilet? Would you rather eat Filet Mignon or ground beef? Buy quality materials and use less of them. Going to the local big box art supplies store can be a challenge. Often the quality is low and the selection limited. Medium quality paints are often labeled “Professional Grade” and marked up accordingly. Phrases like Etude, the word for student in French, are used to make lower quality supplies sound expensive, but they really are just “student grade materials”. PS: Valuable tip: Look at the price of individual tubes of paint. If they are all the same price, regardless of the color, you are more than likely buying lower quality paints. Paint pigments vary in price based on a “SERIES number” from 1 to 5 printed on the paint tube. (Series 5 being the most expensive like your Cobalt and Cadmium pigments, while your earth colors, Yellow Ochre and Burnt Umber, are always Series 1 and less expensive.) Read the labels carefully. If you like Michael Rodman’s Painting Tips and Tricks please SHARE this material with your friends.